Don't worry, you don't have to give up your daily coffee fix to show mama earth some love. This clever porcelain rendition of a paper cup looks just like the modern to-go cup, except this one can be used over and over again. 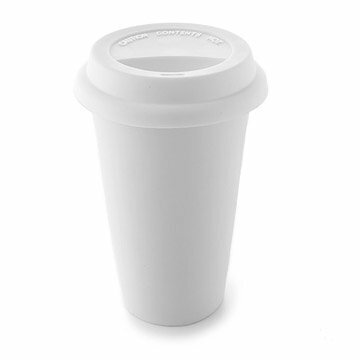 So whether you order black coffee or double mocha cinnamon latte, the original I Am NOT a Paper CupTM made of double-walled porcelain will keep drinks piping hot and paper cups out of landfills. Durable and great for travel. Matte porcelain finish. Comes with one soft silicone I Am NOT a Plastic LidTM in white. Designed by James Burgess. Made in Taiwan. Replacement "I Am NOT a Plastic Lid" in white and black sold separately. Born in 1981 and educated in the UK, James Burgess' design philosophy is simple, "To produce intriguing, interactive products that evoke emotions and memories." James tries to design objects that relate to our everyday lives, with clever references and innuendos. "Design allows me to express my thoughts and ethics with each product reflecting my personality, James said. "I feel design is a way to reinvent our everyday lives and to make the quality of life better for everyone". 6" H: Top: 3.5" dia, Bottom: 2.25" dia; 11 oz. Please note, this item has been discontinued. When it sells out, it will no longer be available. Our apologies for any inconvenience. I gave the I AM NOT A PAPER CUP as a gift and my girlfriend really loved it. She had been using styrofoam cups and this one really will last. Plus it has a flexible top that can be washed. what i love about this cup (and this is the second one i've bought bc i LOST the first one to some lucky individual in Boulder CO) is that people working in coffee shops (which we have MANY of in Boulder) love to touch them. the cup also attracts attention from other people in line. as a result it offers me these GREAT opportunities for authentic conversations about the connection btwn beauty, practicality AND sustainability. this cup is all i need to teach about the environment in an uplifted, non-confrontive way. i say "thanks" to this cup every single day. no joke. Good insulated mug. Only hits are that it does not hold a large amount (which I personally don't mind as I don't drink large hot drinks + if a drink is too large, its not likely to stay too hot anyway...). Also, if you fill it to high and drive w/it, it will spill. I gave this as a gift. It was both practical and fun. I bought this for a co-worker who goes to the coffee shop every morning. She loves the fact that it's so well made and she can bring it in to the coffee shop and not waste paper/plastic cups anymore. I gave this as a gift to my boss. He said it keeps his coffee much warmer than a paper / styrofoam alternative. But the gritty texture of the cup exterior bothers him - says it's like fingernails on a chalkboard. A little heavy, but very useful! The product is very useful and definitely looks very cool. It was a lot heavier than I expected though which made it not very useful for travel/commuting as I thought it would be. But it would be good for taking on car trips and walking around the house. This product has been very useful. It has replaced styrofoam cups to take to work. It's eco-friendly, convenient, and well priced. Well done! This clever porcelain rendition of a paper cup looks just like the modern to-go cup, except this one can be used over and over again.